Same as Antique or Vintage Molded Glass? Are pressed glass and molded glass the same thing? Pressed glass actually is molded glass, since it was made by pressing molten glass into a mold either by hand or by machine. So, yes, pressed glass is another name for molded glass. 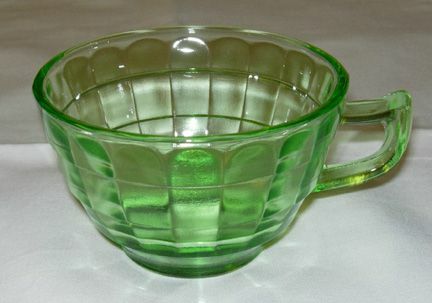 Examples of machine-pressed glass would include most Depression glass patterns along with other types of glassware, and many times mold lines are quite visibly present on these lower quality yet perfectly collectible pieces. This is the type of glassware that would typically qualify as pressed glass. Heisey, among other companies that made fine quality "elegant" glassware, employed the process of manual pressing to produce elegant glassware entirely by hand. Evidence of the mold is rarely seen on these pieces and they're not traditional examples of what is referenced as molded glass. How Was Pressed Glass Finished? Collectible pieces of both hand- and machine-pressed glass were often finished by a method called fire polishing by elegant glass companies. This technique required applying a direct flame to give fire polished (a term often used in marketing glassware when it was new) pieces an even, glossy finish. This finishing process is sometimes referred to as glazing as well. Pieces with a more uneven texture and less of a gleam to the finish were not fire polished. Most of what falls into the pressed glass category will not be finished in this way. Why Is Pattern Glass Sometimes Described as Pressed Glass? Sometimes the term pressed glass is used generically by antique dealers and novice collectors to describe pattern glass. While this type of glass is a form of pressed glass due to the way it was manufactured, the terms used by avid collectors to describe it are most often Early American Pattern Glass or simply pattern glass. Early American Pattern Glass (often abbreviated EAPG in collecting circles) was made using molds of one or more parts depending on the size of the piece being produced, and molten glass was pressed into the molds. The molds could be quite intricate when used to make figural knobs and patterns featuring animals, fruit, and other elaborate motifs. Like Depression glass (although EAPG dates largely to the late 1800s while Depression glass didn't debut until the late 1920s), these pieces were a part of everyday glassware sets when they were new and can contain mold marks, although some of the busier patterns hide them quite well. Do Some Pressed Glass Pieces Look Similar to Cut Glass? Yes, some pressed glass items mimic cut glass and were made as a cheaper alternative to their more labor-intensive and costly counterpart. One company associated with this type of product is Imperial Glass Company. Imperial used the Nucut (pronounced “new cut”) mark on many of its pressed glass pieces that simulate cut glass. But when examined in comparison, the “cuts” on pressed glass pieces do not have the sharp feel to them found when running a finger across a piece of cut glass as if checking glassware for damage. And although the patterns are intricate, sometimes mold lines are present in these pieces as well. How Can You Tell the Difference Between Pressed or Moulded and Blown Glass? The first thing to look for is the presence of a pontil mark on the bottom of the piece. Whether it's rough where the glass making rod was broken off, just a polished bump, or smoothed out to form an oval or round indention, blown glass will have some type of pontil mark present. Molded, or pressed, glass will not have a pontil mark on the bottom. Instead, look for seams present to indicate that a mold was used in the manufacture, as mentioned above. The mold seams are usually found on the sides of the piece where a mold would have fit together during production. Rough mold seams often indicate lesser quality glass, but that doesn't mean those pieces are not collectible. Many types of molded glass, including milk glass, EAPG, and Depression glass, along with many other types are readily found today and they do have a following among collectors.